MIT has come up with a new flexible, transparent solar cell which would make it possible for solar cells to be used in numerous items around us in the near future – in cell phones and laptops, on windows and walls, and more. The device integrates low-cost organic (carbon-containing) materials with electrodes of graphene, a transparent, flexible material made from economical and plentiful carbon sources. This progress in solar technology was facilitated by a novel technique of depositing a one-atom-thick layer of graphene onto the solar cell — without damaging adjacent sensitive organic materials. Until recently, developers of transparent solar cells have usually depended on costly, brittle electrodes that are inclined to crack when the device is flexed. The ability to use graphene instead is making possible really flexible, economical, transparent solar cells that can turn almost any surface into a source of electric power. Photovoltaic solar cells composed of organic compounds would provide a range of advantages over present day inorganic silicon solar cells. They would be easier to manufacture and cheaper. They would be lightweight and flexible rather than rigid, heavy and fragile, and so would be easier to transport, including to remote regions that do not have a central power grid. And they could be transparent. A number of organic materials absorb the UV and infrared components of sunlight but convey the visible part that human eyes can detect. Organic solar cells could thus be mounted on any surface found around us and harvest energy without anyone being aware of them. Scientists have made substantial progress over the last 10 years toward developing transparent organic solar cells. But they have met one persistent hurdle: finding appropriate materials for the electrodes that transport current out of the cell. It’s rare to find materials in nature that are both electrically conductive and optically transparent. The most extensively used current option is indium tin oxide (ITO). ITO is conductive and transparent, but it is also rigid and brittle, so when the organic solar cell bends, the ITO electrode is inclined to crack and lift off. Moreover, indium is expensive and relatively rare. A potential alternative to ITO is graphene, a form of carbon that can be found as one-atom-thick sheets and has extraordinary characteristics. It is extremely conductive, robust, flexible and transparent; and it is made from ubiquitous and inexpensive carbon. Furthermore, a graphene electrode can measure just one nanometer in thickness — a fraction as thick as an ITO electrode and a much better match for the thin organic solar cell itself. Two main issues have decelerated the wholesale acceptance of graphene electrodes. The first issue is positioning the graphene electrodes onto the solar cell. A majority of solar cells are constructed on substrates such as plastic or glass. The bottom graphene electrode is deposited straightaway on that substrate — a task that can be accomplished by processes involving solvents, water and heat. The other layers are then incorporated, ending with the top graphene electrode. But placing that top electrode onto the surface of the so-called hole transport layer (HTL) is complicated. The HTL dissolves in water, and the organic materials just below it are sensitive to pretty much anything, including water, solvent, and heat. Consequently, the Researchers have usually persisted in using an ITO electrode on the top. The second issue with using graphene is that the two electrodes have to play varied roles. The ease with which a given material releases electrons is a set property called its work function. But in the solar cell, only one of the electrodes must let go of the electrons easily. Therefore, having both electrodes made using graphene would require altering the work function of one of them so the electrons would discern which way to go — and altering the work function of any material is not simple. In the last three years, Kong and Song have been involved in solving these issues. They first created and optimized a process for placing the bottom electrode on their substrate. In that method, they grow a sheet of graphene on copper foil. They then transferred it onto the substrate using a method showed by Kong and her colleagues in 2008. They placed a layer of polymer on top of the graphene sheet to support it and then used an acidic solution to etch the copper foil off the back, resulting in a graphene-polymer stack that they transferred to water for rinsing. They then just scooped up the floating graphene-polymer stack with the substrate and removed the polymer layer using heat or an acetone rinse. The outcome: a graphene electrode resting on the substrate. However, scooping the top electrode out of water is not achievable. Alternatively, they turn the floating graphene-polymer stack into a kind of stamp, by pressing a half-millimeter-thick frame of silicon rubber onto it. Clutching the frame with tweezers, they take the stack out, dry it off and place it down on top of the HTL. Then, with little warming, they can peel off the silicon rubber stamp and the polymer support layer, leaving the graphene positioned on the HTL. Primarily, the electrodes that Song and Kong created using this process did not perform well. Tests revealed that the graphene layer did not stick tightly to the HTL, so current could not flow out efficiently. The apparent solutions to this issue would not work. Heating the structure sufficiently to make the graphene stick would damage the sensitive organics. And coating some kind of glue on the bottom of the graphene before placing it down on the HTL would stick the two layers together, but would end up as an added layer between them, decreasing rather than increasing the interfacial contact. Song decided that incorporating glue to the stamp might be the only solution — but not as a layer under the graphene. We thought, what happens if we spray this very soft, sticky polymer on top of the graphene? It would not be in direct contact with the hole transport layer, but because graphene is so thin, perhaps its adhesive properties might remain intact through the graphene. To put the idea to the test, the Researchers added a layer of ethylene-vinyl acetate, or EVA, into their stamp, right on top of the graphene. The EVA layer is very flexible and thin — resembling food wrap — and can easily tear. But they discovered that the polymer layer that comes next holds it together, and the arrangement functioned just as Song had anticipated: The EVA film sticks tightly to the HTL, compatible to any microscopic rough features on the surface and forcing the fine layer of graphene underneath it to do the same. The process not only enhanced performance but also brought an unanticipated extra benefit. The Researchers thought their next assignment would be to discover a way to alter the work function of the top graphene electrode so it would vary from that of the bottom one, guaranteeing smooth electron flow. But that step was not required. Their method for placing the graphene on the HTL actually alters the work function of the electrode to precisely what they need it to be. To view how well their graphene electrodes would perform in practice, the Scientists needed to add them into functioning organic solar cells. For that job, they chose the solar cell fabrication and testing facilities of their colleague Vladimir Bulović, the Fariborz Maseeh (1990) Professor of Emerging Technology and Associate Dean for Innovation for the School of Engineering. For comparison, they constructed a series of solar cells on stiff glass substrates with electrodes composed of graphene, aluminum (a standard electrode material) and ITO. The current densities (or CDs, the quantity of current flowing per unit area) and power conversion efficiencies (or PCEs, the fraction of incoming solar power converted to electricity) for the new flexible graphene/graphene devices and the standard stiff ITO/graphene devices were similar. They were lower than those of the devices with one aluminum electrode, but that was a finding they projected. “An aluminum electrode on the bottom will reflect some of the incoming light back into the solar cell, so the device overall can absorb more of the sun’s energy than a transparent device can,” says Kong. The PCEs for all their graphene/graphene devices — on stiff glass substrates as well as flexible substrates — ranged from 2.8% to 4.1%. While those values are way below the PCEs of current commercial solar panels, they are a great improvement over PCEs realized in previous work involving semitransparent devices with all-graphene electrodes, the Researchers say. Measurements of the transparency of their graphene/graphene devices produced more encouraging results. The human eye is capable of detecting light at wavelengths between about 400 nm and 700 nm. The all-graphene devices revealed optical transmittance of 61% across the entire visible regime and up to 69% at 550 nm. “Those values [for transmittance] are among the highest for transparent solar cells with comparable power conversion efficiencies in the literature,” says Kong. 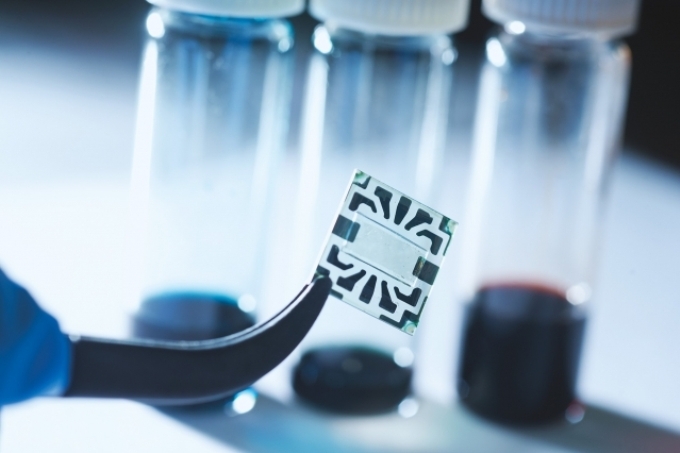 To show that versatility, they placed their graphene-graphene devices onto flexible substrates including opaque paper, plastic and translucent Kapton tape. Measurements revealed that the performance of the devices is approximately equal on the three flexible substrates — and only somewhat lower than those made on glass, likely because the surfaces are rougher so there is a better potential for poor contact. The ability to deposit the solar cell on all surfaces makes it favorable for use on consumer electronics — a field that is expanding rapidly around the world. For instance, solar cells could be produced directly on cell phones and laptops instead of being fabricated separately and then installed, a change that would greatly bring down manufacturing costs. They would also be suitable for future devices such as paper electronics and peel-and-stick solar cells. Since those devices would unavoidably be bent and folded, the Researchers exposed their samples to the same treatment. While all of their devices — including those with ITO electrodes — could be folded again and again, those with graphene electrodes could be bent a lot more firmly before their output began to decline. The team is currently working to enhance the efficiency of their graphene-based organic solar cells without sacrificing transparency. (Increasing the sum of active area would push up the PCE, but transparency would decline.) According to their calculations, the highest theoretical PCE attainable at their present level of transparency is 10%. “Our best PCE is about 4 percent, so we still have some way to go,” says Song. They are also currently thinking about how best to scale up their solar cells into the large-area devices required to cover whole walls and windows, where they could resourcefully produce power while staying virtually invisible to the human eye. This research received support by the Italian energy company Eni S.p.A. as part of the Eni-MIT Alliance Solar Frontiers Center. Eni is a Founding Member of the MIT Energy Initiative.